I have no legit excuse for my absence of almost 2 weeks except that I was uninspired. It's like having a writer's block and you don't know what to do. Well, until a night ago when I got an idea for a nail art. But before anything else, I'd like to say that November 2014 marks the 5th year anniversary of my blog! I can't believe that it has been that long already. Although I started blogging in 2009, my nail art posts only began mid of the following year. Regardless, I am thankful to all of you who have supported me and for all the blessings this blog have received. I called it "Merry Go Yellow" because of how I painted the design. I simply went round and round with broken lines. This was simple to create and I really liked how it turned out. I used 2 coats of OPI A-taupe the Space Needle as background color. I thought it was the perfect brown shade for a bright yellow nail art. It didn't disappoint. Surprisingly, I did not use any nail art brush for this design. I used a dotting tool instead. It was not as I have planned. Honestly, I was feeling a little lazy so I thought that using a dotting tool would be easier to accomplish this nail art. But I was worried about precision that a brush will be able to do. Turned out, the dotting tool resulted to the effect I wanted. 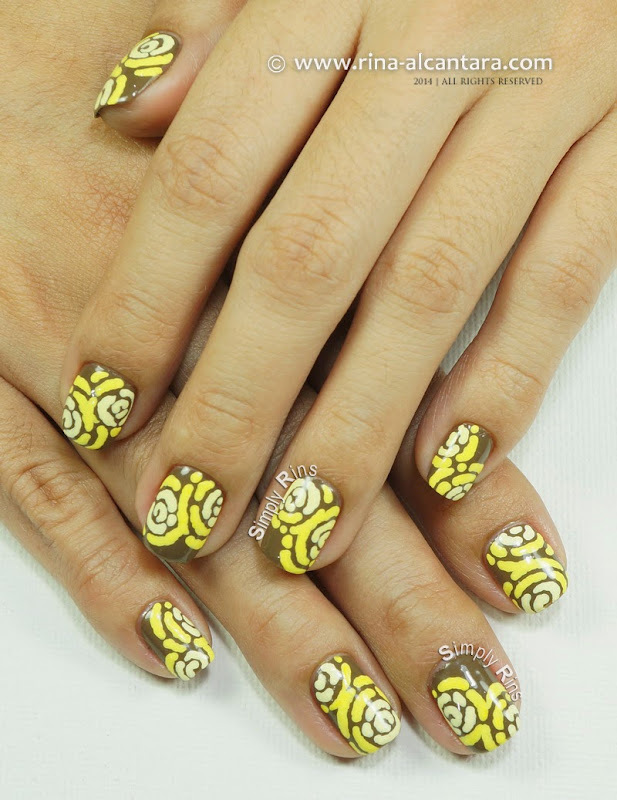 I decided to use 2 shades of yellow just to make this nail art more interesting. I started off with a lighter shade to create the center and used a brighter hue for the outer lines. I painted 2 center points on each nail and as I built broken curved lines around it, they intersect each other. I love abstract nail designs like this. I find them very wearable and classy on the nails. I guess that's why I have so many in my nail art gallery. 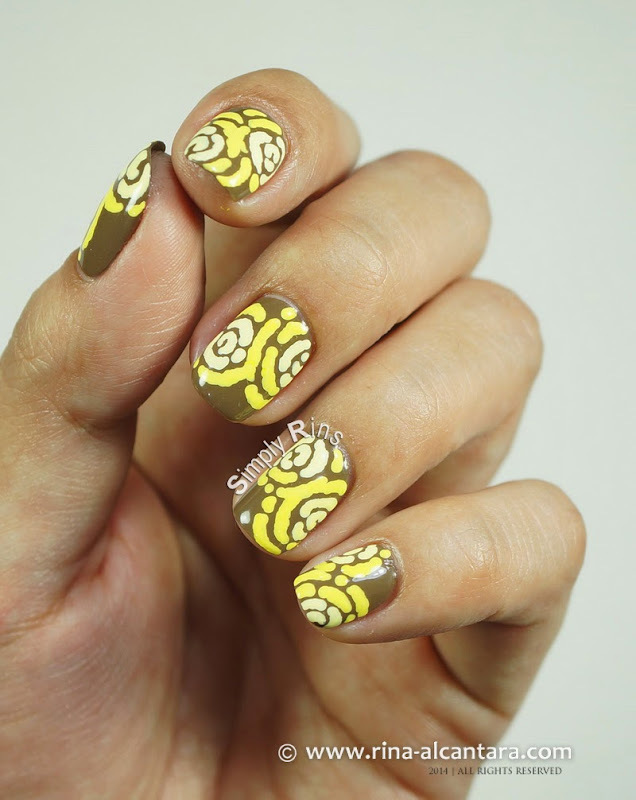 From a distance, this particular nail art looks like a ripple and is somewhat hypnotic to look at. It is also quite attractive because of the color. If you'd like it to appear more subtle, you could probably use a different color scheme. Or, you could downplay it by just having 1 "ripple" per nail. I could definitely recommend this for nail art beginners. This is very easy to do even with your non-dominant hand since you'll be working with a dotting tool. I wish I was able to do a video tutorial for this. Sadly, I really didn't expect anything will happen when I sat on my personal nail station. But I hope you'll be able to recreate this design through the photos. Let me know if you do. I would love to see your personal twist. Congratulations! I'm still in awe of your nail art creations. More power to your blog! Woo hoo congrats on the anniv! You continue to be an inspiration to me and others. Loved the merry go round nailart..